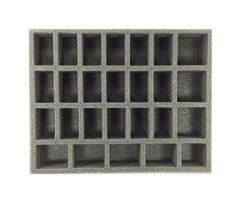 This tray is made for 28mm models. It will hold 26 troops, such as Imperial Guard troops, Chaos Beastmen, Tau fire warriors or other similar size models. This tray comes with 18x 1 3/4 x 1 inch (44 x 25 mm) cut outs, 3x 1 3/4 x 1 3/4 inch (44 x 44 mm) cut outs, 4x 1 3/4 x 1 1/4 inch (44 x 32 mm) cut outs and 1x 1 1/2 x 1 1/4 inch (38 x 32 mm) cut out.